The latest version 3.1 of the Trivadis PL/SQL & SQL Coding Guidelines has 150 pages. More than 90 additional pages compared to version 2.0. Roger Troller did a tremendous job in updating and extending an already comprehensive document while making it simpler to read and easier understand. In this post I will emphasise some changes I consider relevant. In version 3.1 the characteristics for changeability, efficiency, maintainability, portability, reliability, reusability, security and testability as defined by the Software Quality Assessment based on Lifecycle Expectations (SQALE) methodology are used to categorise guidelines. A guideline is associated with one or more SQALE characteristics. Additionally a guideline is assigned to a severity (blocker, critical, major, minor, info). So guidelines are categorised in two dimensions: SQALE characteristics and severity. These categorisations are used to filter guidelines in SonarQube or PL/SQL Cop to be enabled or disabled. It’s not by chance that SonarQube is using exactly these categorisations. In this excerpt you see other changes as well. The reference to the CodeXpert rule is gone, the guideline 12 got a new identifier 2150 and there is a good and bad example. In version 2.0 some guidelines had no examples, some just an excerpt of an example, some just a good and some just a bad example. 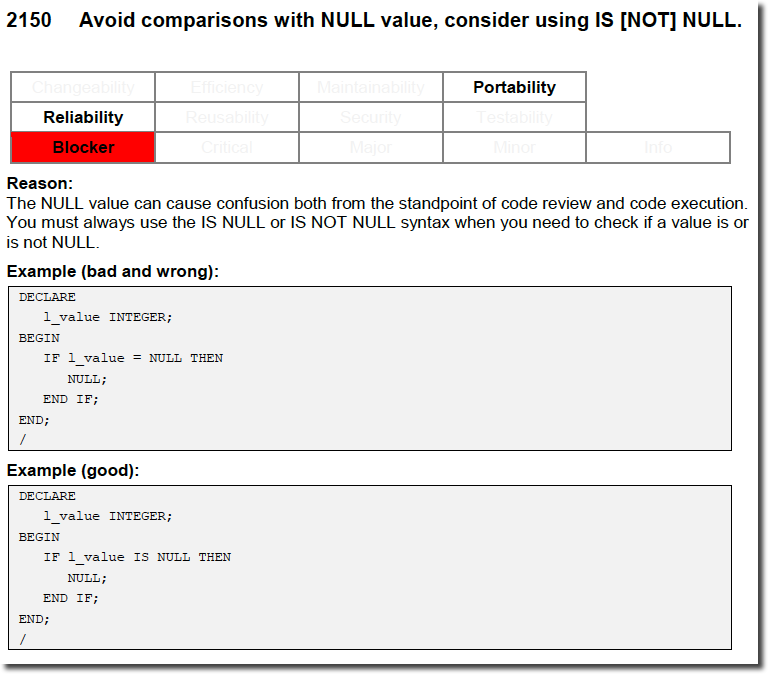 Now in version 3.1 almost every guideline has a complete bad and a complete good example. With complete I mean that they are executable in SQL*Plus, SQLcl or within your IDE of choice. Why “almost”? For example, there is this guideline 65/7210 which says “Try to keep your packages small. Include only few procedures and functions that are used in the same context”. So, in some cases it is just not feasible/helpful to include a complete example. For me as the guy who is responsible to write rules to check the compliance of the guidelines, good and bad examples are essentials for unit testing. Such examples also help the developer to understand guidelines. That’s why we include these examples in PL/SQL Cop. The guideline 54 “Avoid use of EXCEPTION_INIT pragma for a -20,NNN error” is not part of the document anymore. All guidelines got a new identifier. The first digit identifies the chapter of the document, e.g. “1” for “4.1 General”, “2” for “4.2 Variables & Types”, etc. The second digit is reserved for the sub-chapters and the remaining digits are just for ordering purposes. The gaps in the numbering scheme should allow to add future guidelines at the right place without renumbering everything (again). PL/SQL Cop is mentioned in the guidelines. However, currently only the Trivadis PL/SQL & SQL Guidelines Version 2.0 are supported. But sometime in Q4 of 2016 an update supporting version 3.1 should be available. Get your copy of the Trivadis PL/SQL & SQL Guidelines Version 3.1 from here.